Today I'm sharing this awesome birthday card Samantha Mann! She used the image of the flamingo wearing an inner tube from the Flirty Flamingos stamp set - love how she colored with the some fun pink speckles! 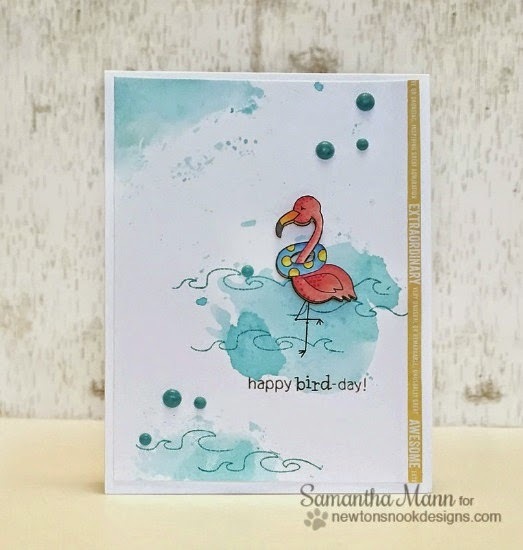 Then she created some really fun watercolor splotches for the background and added in some waves using the wave border from the Beach Party stamp set! This is such a great beachy card to send someone for to wish them a cheerful birthday! For more details on this awesome card, check out Samantha's Blog, Sam's Scrap Candy! This is such a fun and cute card with beautiful coloring! I am seriously in love with this background! Stunning card! Love those flamingos!